One thing I think we do really well is connect with our couples and form friendships with them over e-mail before ever meeting them in person. Meng + Matt were no exception, in fact, they were a perfect example of this! 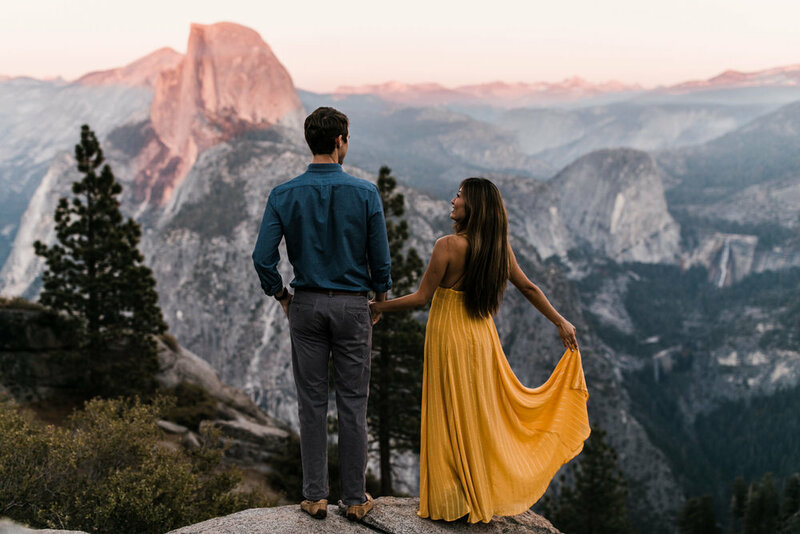 By the time we finally met up for their engagement photos at Glacier Point, I felt like I was meeting a long lost friend. They brought us our favorite snacks (snickers for me, gummies for Callen) along with champagne and beers, so we definitely all had a great time! 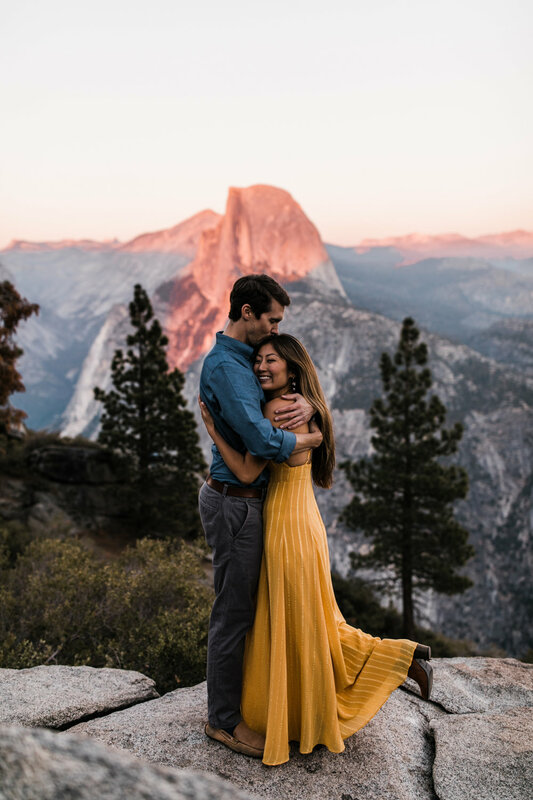 We started their session in the forest because Meng mentioned how much she loved being surrounded by giant trees, and eventually made out way down to Glacier Point overlook (or should I say, one of our many secret ledges to view the overlook without all the tourists!) for sunset. I will never get tired of watching the sun spend it's last moments of every day painting Half Dome orange, then pink, then deep purple as it disappears behind us. 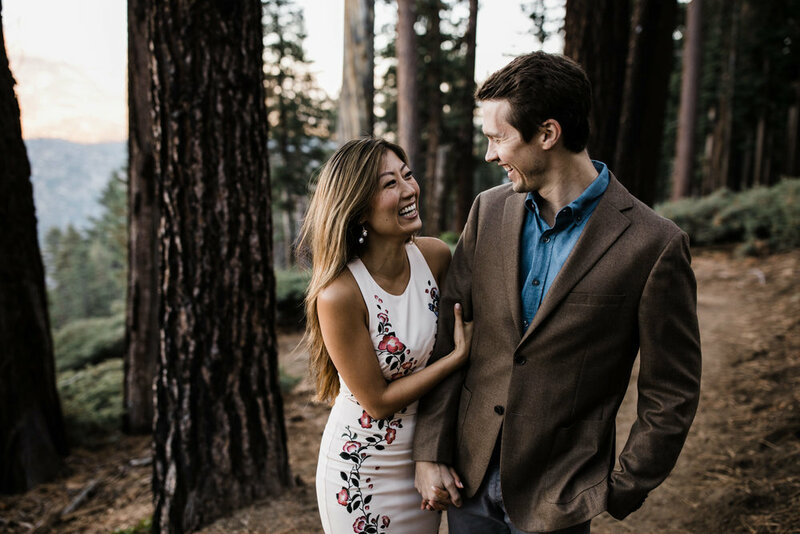 Meng + Matt were fearless as they danced around on a narrow rock overlooking little Yosemite Valley. Once the sun had set, we spent blue hour at another favorite ledge, taking in the last bits of light and soaking up the beauty of the park. This was our last time up at Glacier Point for the season and it was bitter sweet to watch it fade into dark one more time knowing we won't see it again until June (unless we motivate for the 16-mile snow shoe...who wants in?!). We walked back in the chilly dark, talking about wedding plans and life on the road, adventure and what the future might look like. It was so much fun finally getting to know these two in person and was an evening we will not soon forget!